Compatible with JST any Losi Battery Connectors. - Works with most 1S batteries Micro RC Drone, Helicopter & Airplane. - Shows each battery's status and tells you what is ready to use immediately. 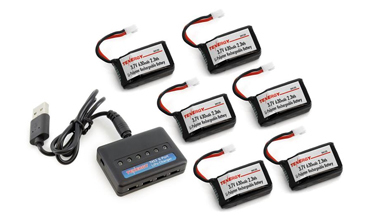 This 3.7V 630mAh 20C LiPO battery is a replacement battery. It will give more PUNCH and ROBUST performance due to its higher current output and power. Direct replacement battery for Syma X9, no modification is needed.